There are several foundations I have my eye on that I haven't actually tried yet because I haven't got round to buying them or because they're a little on the pricey side and ideally I'd like to try a sample before investing. One of these foundations is Vichy's Dermablend. Although this is around mid-range (£18) I've always been a little cautious about colour matching and whether a full coverage foundation like this would work for me. So I was delighted to receive an email from L'Oreal, the parent company to Vichy, asking if I'd like to try some Dermablend products. 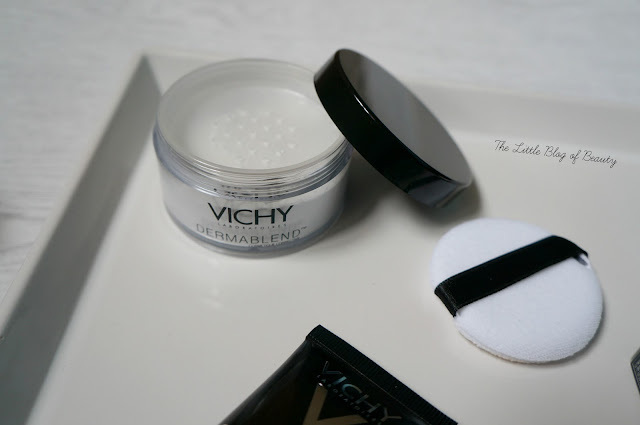 I was kindly sent the Vichy Dermablend Corrective fluid foundation*, Dermablend setting powder* and a foundation brush*. Although my skin is doing quite well at the moment I do go through periods of breakouts, scaring, redness and dark circles (usually all at the same time, what a lucky girl) and often each of these things can be quite difficult to try and cover. I'm not a fan of plastering on makeup to try and cover issues like this, as often I think it draws attention to the area, so full coverage foundations are not something I've really tried before for fear of ending up with a caked on look. Dermablend was created by an American dermatologist, Dr. N. Craig Roberts, back in 1981 (so it's a year older than me) and it apparently changed his wife's life. The Dermablend Corrective fluid foundation contains a high concentration of pigments to provide a better coverage than standard foundations that is buildable, highly blendable and provides a natural finish. It's suitable for sensitive skin, is non-comedogenic (doesn't clog pores), long lasting, and contains SPF 35. Other products available in the range include a Corrective stick (concealer), Corrective compact cream (compact cream foundation), Total body corrective foundation (a foundation for use on the body) and of course the setting powder that I'll also be talking about here. Previously I wouldn't have been able to use the Dermablend Corrective fluid foundation as the lightest shade available was Opal, which would have been too dark for my pale, almost see-through skin. Luckily Vichy have now released a lighter shade, Porcelain, for pale ladies like myself and this was obviously the shade I chose to try. 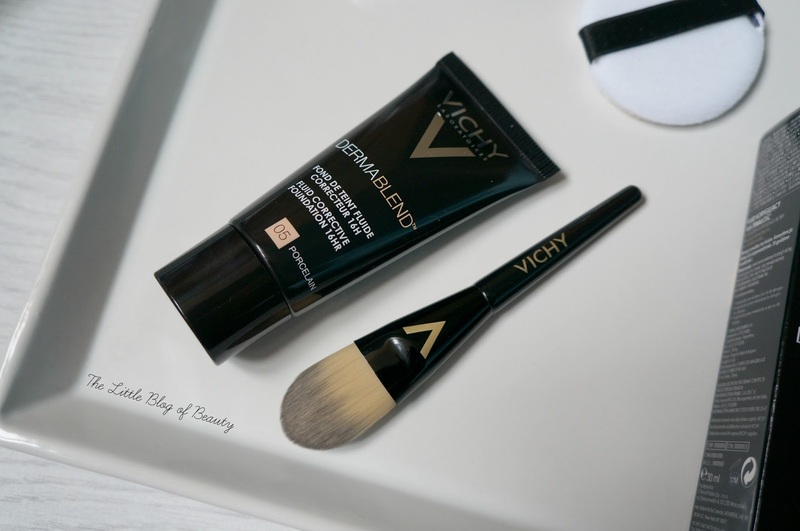 There's a sleek black theme through the whole Vichy Dermablend range and the foundation comes in a very easy to use squeezy tube. I was expecting the foundation to be quite thick but actually it's not really any different from a standard foundation. Although it is a little thicker than I'm used to at the moment as I currently use the YSL Fusion Ink foundation, which has a lighter more serum like feel to it. Because the Dermablend foundation is high coverage I'd definitely recommend starting off with a small amount and building it up if you need to. To start with I went for my usual method of application using my RT buffing brush. Buffing this in feels a little drier than I'm used to but I found that with a little more work it did blend well. However I found that buffing this into my skin meant the foundation settled into my pores and although it didn't look bad from a distance up close it did have a 'speckled' effect over some areas (particularly my cheeks and chin) where it was sat in my pores. I didn't find that it clogged up my pores and caused any breakouts, but I wasn't keen on how it looked on my skin. Although I'm not a fan of using foundation brushes for applying my base I next tried using the foundation brush that Vichy sent with the products. I found that as long as I was careful with my blending I didn't end up with any brush strokes and although this method was better than using a buffing brush I did still slightly end up with the 'speckled' effect. Knowing that a sponge usually provides the most natural, almost airbrushed finished this was the method I tried next and I found that this was by far the best method of application. Pressing the foundation onto my skin with a sponge prevented it settling into my pores and provided the best finish. As I used a damp sponge this did sheer out the coverage slightly but I just applied some more to the areas that needed it. Coverage wise I personally didn't quite find this to be full coverage, but then I've used grease paint (stage foundation) in the past and that stuff is full coverage (and nasty!). It did very well at covering breakouts, scaring, redness and dark circles but I was cautious about adding more and more and instead went for a small amount of concealer over the top. I really wanted to love this foundation, and I do think it's a very good foundation, but unfortunately it didn't work well with my skin. I usually have dry and dehydrated skin that strangely can become oily in places when I cover it with foundation, usually on my chin, eye lids and sometimes around my nose. I did like the look of my skin when I first applied it, but I really don't think this would last 12 hours on me as it just doesn't sit well after a few hours. I think I might reach for this if I do need a good level of coverage, but not if I need my makeup to last really well, if I'm on set for example. The Dermablend setting powder is a loose powder that fortunately comes with a sifter (to help prevent those little snow storm accidents) and puff applicator. The powder is white, and is very white when first applied, but when you pat this into the skin it becomes translucent. You do have to be careful not to apply too much though or it can look a little powdery. As I mentioned above once I apply makeup over my chin it can become oily and usually it really does go for it. Often within an hour or two my chin can be a bit of an oily makeup mess and I'm yet to find a powder that really does hold this off for at least a bit longer. Although I do like this powder it doesn't appear to help with my makeup destroying oily skin conundrum. If you're happy using the puff to apply this you could carry this with you for touch ups throughout the day as long as you're careful and make sure you screw the lid back on tightly. Although I'm disappointed the Dermablend products didn't work so well with my skin I think they are good products and I'd recommend giving them a try if you're looking for a high coverage foundation. 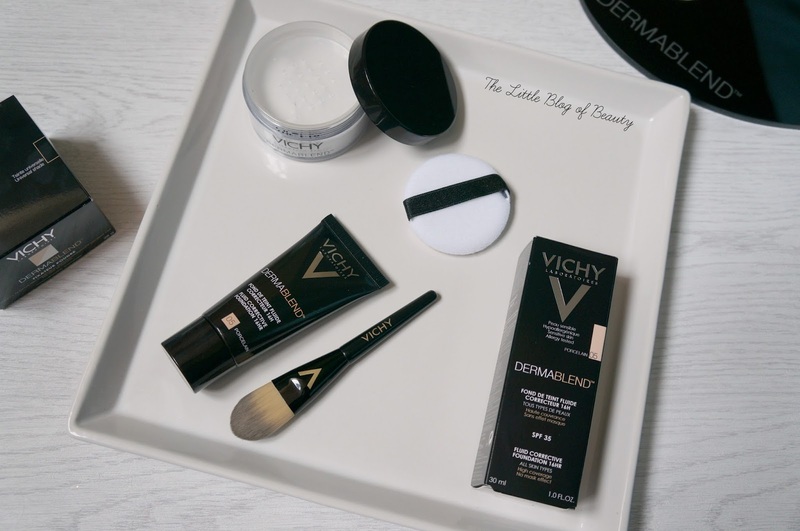 You can find the Vichy Dermablend range on the Escentual website and in Boots stores and the range is currently on offer at both retailers. 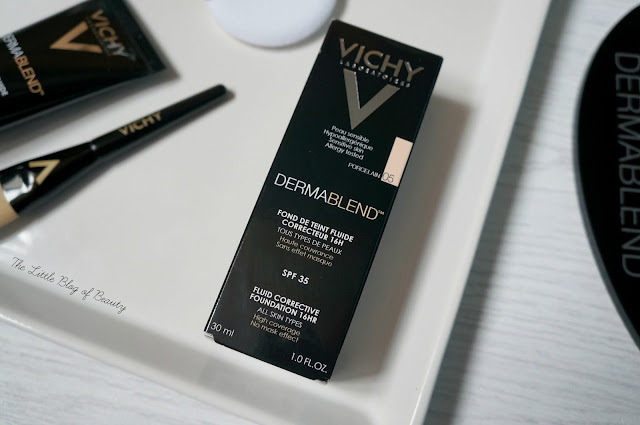 Have you tried any Vichy Dermablend products?